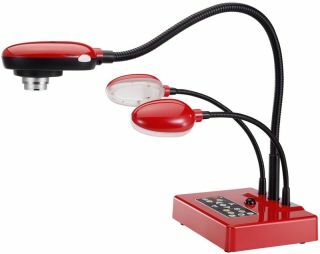 The Lumens DC265 is a portable visual presenter with the power of a desktop model designed for use in K-12 education. Along with the 6x optical zoom, the DC265 provides UXGA resolution capturing up to 46% more image detail than SXGA, all easily controlled with single-touch, one button auto focus. Pros: Teachers can record lessons directly onto the included SD card without additional software. With a click of the “Slide Show” button, teachers can play professional-looking slide shows (up to 300 slides per minute) complete with transition effects from saved images from the included internal memory, or from an SD card. Teachers can use these recording capabilities not just to record lessons, but to post to their Web sites for student review. Includes a five-year warranty. Cons: Price may be a bit high for some schools. Overall evaluation: The DC265 ranks with visual presenters that cost two to three times as much. It is a high-end product at a mid-range price.